My favourite film is “Stand By Me“. Who always stands by me? Greg, my cats…and also my iPhone, iPad and iPad mini…I wanted to capture this in a photo. 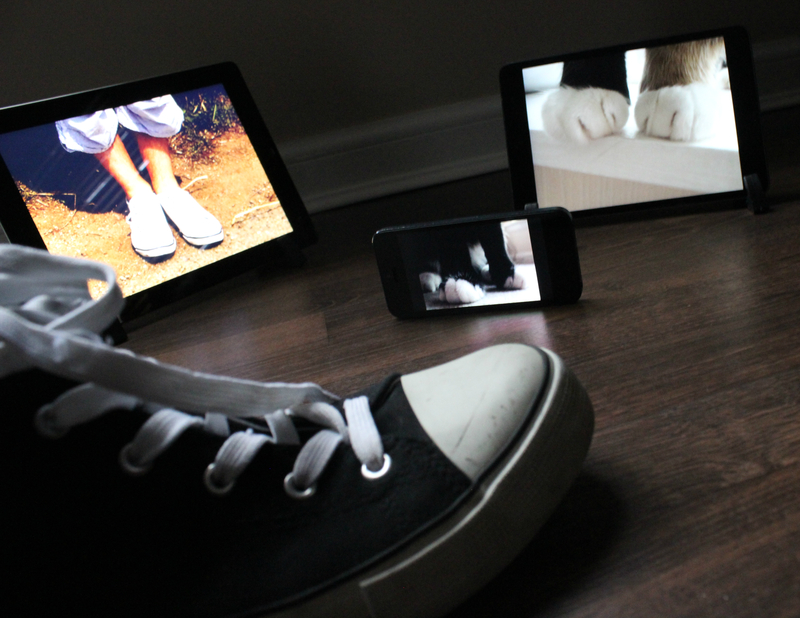 I tried to use all the devices to show photos of Greg’s feet and the cat’s paws standing by me in my trainers. All edits were carried out using Pixlr Express. What about you – how would you represent your favourite movie in a photo form? Try it and share your results with me. Cool idea. Once I narrow it down to my absolute favorite, I might give it a go. Thanks – yeah it’s a difficult thing to try and choose isn’t it? That is pretty cool! They look just like photo frames! Love the photos! You are so creative. When I get a chance, I’ll check out your photos on Flickr. 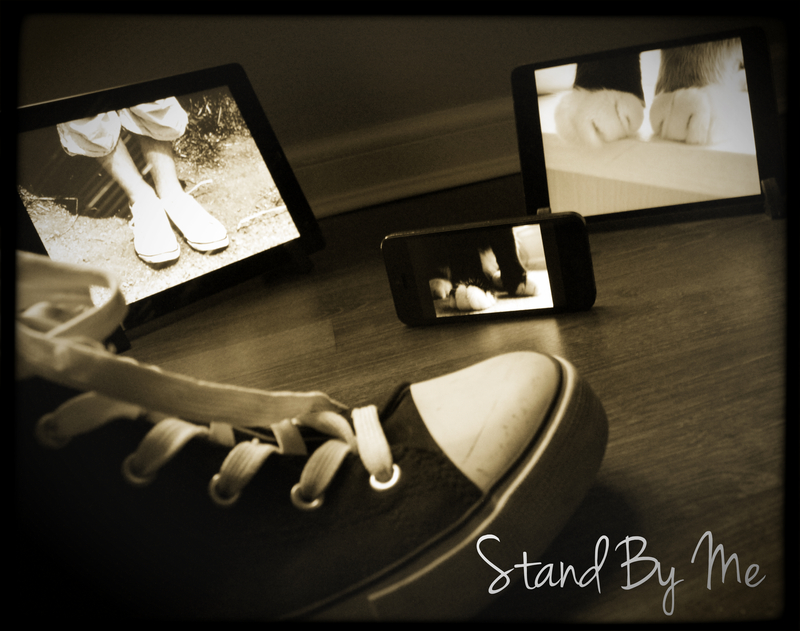 I love how a photo can tell a story and I love “Stand by Me,” too. 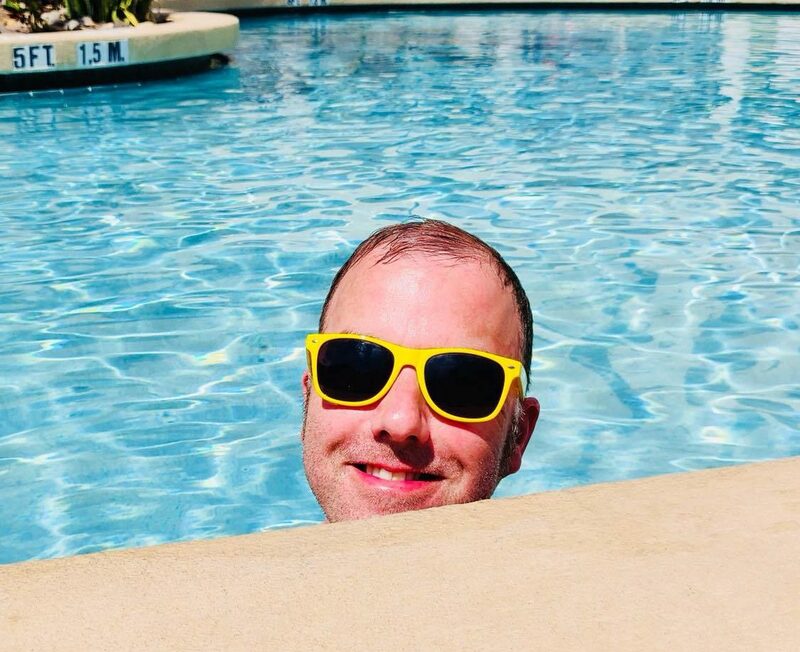 So I connected with your photo. I think that’s what makes a great photographer, when people can emotionally connect with their photos. Great job! I really find it interesting. Loved your Pics. I’d leave my own comment, but she said everything I wanted to say. I may just follow Hayley around and just reply, me too, to everything she writes. Would save me some time. I liked the different looks of same picture. Recently I am liking black and white photos. Movie wise……the only one (don’t know what this says about me) I can think of off top of my head is Guardians of the Galaxy. I could shot me and a few friends doing Wonder Woman stances. In black and white of course – classy…….or not. Y’know, I’ve never seen Stand By Me. But it feels like I have, and I should, ha. I love everything Rob Reiner has done. And I like the Gordon filter. Thanks Lorna and yeah defo you should watch the movie! I love this idea, so creative! And the filter gives it a good dramatic feel. Trying to decide what mine would be… maybe if I pick the Lego Movie I have an excuse to build a lego version of my friends and family, that would be fun! Really nice! I love the feet theme. Particularly the cats!! Ahhh, that movie is such a classic; I’ve seen it more times than I can count. Love the photos. I love what you did there Steve! Very artistic!!! Never seen the movie, but you pique my curiosity. Nice photo! Ok. I’ll try to find it on Netflix. Thanks. Very much like, very creative! Well, glad you had a spring clean in that case. It’s a good repost! I really liked this. Stand by Me is one of my favourite movies too. It is a timeless movie. Would you mind putting this on your page to show the people that entered your challenge that I’ve got a similar new one? Ah ok. Cool, no worries.